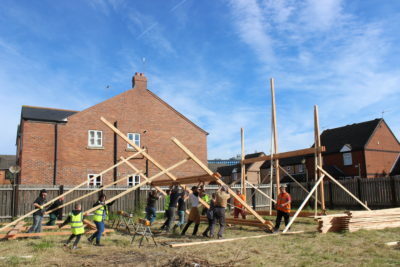 Caroline Gore-Booth, Project Coordinator at Giroscope, shares the story of this award-winning community-led housing scheme in Hull. Giroscope was formed in 1985 by a group of students and young unemployed people. Fed up with renting poor quality private sector housing they decided to take advantage of Hull’s low house prices to help themselves, and others in similar circumstances. Pooling their money the group managed to purchase 4 properties, which they set about renovating to provide homes for both themselves and other unemployed people. At this stage the group had no real construction skills and no experience of letting properties, however when they advertised the first house they realised the extent of the housing need and were driven to move Giroscope forward. 32 years later Giroscope owns 98 properties which provide housing to over 250 people. Our project is based in west Hull, in an area of high deprivation, low incomes and high levels of unemployment. Much of the housing in this area is of poorly managed and maintained; the craze of buy-to-let property has led to a high turnover of tenants and many properties have been left vacant. 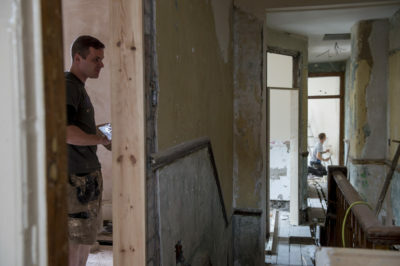 We tackle these issues by renovating empty houses, providing work experience and training to help people into work and providing decent, secure, affordable homes to people in housing need. In 2016 we won the prestigious World Habitat Award for practical and innovative housing projects from around the world. Giroscope is based in the heart of the community in which we work, and the involvement and participation of local people is key to our success. Each year we provide volunteering and training opportunities to over 140 people, many of whom have complex or multiple barriers to work. Over 2/3rds of the staff at Giroscope have been employed through our Volunteer Programme and we are committed to empowering and engaging people so that nobody feels isolated from their community due to poverty, homelessness or prejudice. Over the years Giroscope has also supported other community projects, social enterprises and local businesses – we rent affordable workspace to 15 organisations and have also developed our own enterprises: a construction/landscaping business, a community garden, a bike workshop that repairs and recycles bicycles and an IT project. Next year we are planning to start our first new-build project with our community self-build scheme of 4 properties on a vacant piece of land in our neighbourhood, as well as the new build and the refurb of 3 large empty properties. The diversity and variety of work is exciting – newer projects compliment our core work, as well as developing and expanding it to provide better opportunities, or tackle need or issues in our area. The so-called ‘housing crisis’ has affected different parts and communities of the UK in different ways: from the high house prices in London and the South East, to areas with large numbers of empty homes in the North, as well as the chronic shortage of social rented accommodation or poor quality private rented housing. The challenge for community-led housing projects is how to best meet the specific need in an area and provide genuinely affordable homes for people in housing need. People want good homes in the areas they love. Communities can lead the way.